By placing an order with wine’n’things you are confirming that you are 18 or older. 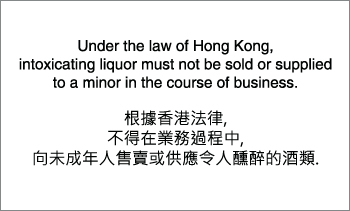 It is illegal for us to sell alcohol to anyone under the age of 18.
wine’n’things shall make every effort to ensure that all prices, details and sizes of products are up to date. All orders are subject to availability and wine’n’things reserves the right to reject an order if any products or services become unavailable. In the event of this occurring the customer will be informed by telephone or email before the requested delivery date and be offered a suitable alternative or to refund the order. Our standard delivery is $120 for orders under $1000 to Hong Kong Island, Kowloon and New Territories. For outlying islands additional charges apply. For a full list of delivery days and charges please click HERE. If your order is damaged, between dispatch and delivery, we will send you a replacement order as soon as we can. If we are unable to dispatch replacement goods within 7 days we will offer you a full refund. For these purposes, delivery takes place when products are left at your delivery address or with someone else in accordance with your instructions. For your own security we reserve the right to contact your card issuer for the purposes of carrying out security checks. We take your privacy very seriously and will not pass on your details to any third parties. Products offered by us are displayed on our website(s) in ‘real time’. This is to say that any product may be withdrawn from offer or sold out without notice. All promotions are a onetime offer per person unless otherwise stated. For example spend X and get Y free cannot be ordered more than once per person per promotion. wine’n’things reserve the right to change the terms and conditions at any time. Can be used to purchase products from Wine’n’things only. They cannot be exchanged for cash. Are valid for 1 year from date of purchase unless otherwise stated. Cannot be replaced if they are lost or stolen. Cannot be redeemed against previous purchases. Any purchase less than the value of a gift certificate causes the unused balance to be placed in the account of the gift certificate recipient for use in a future transaction. Any purchase exceeding the value of a gift certificate requires the use of a valid credit card to complete the transaction. Wine miles are available on every purchase on the wine’n’things site only. Every HKD $10 spent is worth 1 mile. 1 mile is equal to $0.30. From time to time wine’n’things will run promotions which will change the value of the wine miles for a limited time only. The promotion will only be available in the notified time frame. Wine miles can be redeemed for wine’n’things products only. Wine miles are not exchangeable for cash. Wine miles are also not collected when wine miles are used for purchase. wine’n’things reserves the right to terminate wine miles at any time. wine’n’things will grant Quaffer status following an annual subscription of $650. This subscription will be automatically paid annually until the Quaffership is cancelled (see point 7). A Quaffership is non refundable nor exchangeable. Quaffers are exclusively offered a 10% discount off all full priced orders. There is no obligation to order whatsoever. You decide when you want to order and what you want to order. We use “cookies” (small files placed on your hard drive) within our website to help analyse our web page flow, customise our services and to measure our content and promotional effectiveness.